Christmas this year has been totally hectic, and I'm glad to finally be able to sit back and take a breather. My swappee loved it, which was great, but it was my first time knitting a shawl, and by the end of it, with so many stitches on the needles, each row seemed to take forever! I then received this package in return, with yummy Malabrigo sock yarn, which I've been wanting to try for ages! Next up was socks for Mum. As I knit her a pair of socks every year for Xmas, I couldn't break with tradition. Yarn was Socks that Rock Mediumweight - Spaun of Brawn colourway. I used a basic toe up pattern, with afterthought heels. Went down to the wire on these ones, finishing up at 10 minutes to midnight on Xmas Eve! 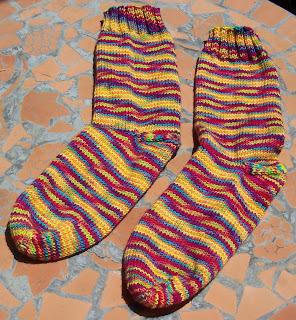 Sock 2 was done in 2 days, both very very hot, and knitting in 40 degree heat - not fun. Mum did love them though, and that's what counts. 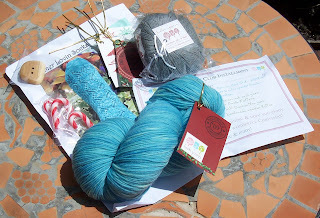 And last up - the two yarn club packages I received in December. First up is the delightful package I received as the first installment of Knitabulous' Indian Summer Club. 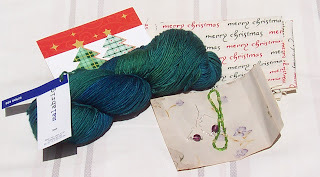 The colour of the yarn is gorgeous, and I loved all the extra goodies that were included - DPN's, lip gloss, tea, chocolate - all of my favourite things. 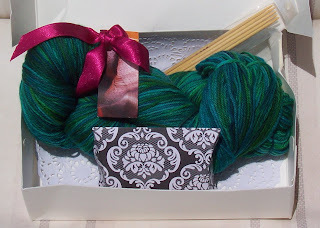 The other package was the first installment of Lush Yarn's Summer Sock club package. 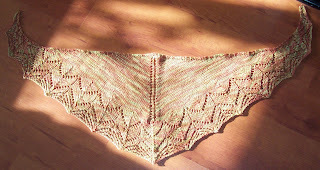 The pattern is gorgeous, and I had to refrain myself from casting it on right away. I loved the extra goodies included in this, especially the 50g ball of cashcotton (can't wait to try it out). 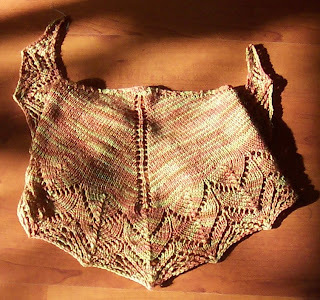 The lace pattern for this was quite easy to follow, and I'd definitely recommend it for a starter pattern as this was my first real lace piece! Love that shawl. The colors of the Indian Summer Club are so beautiful... what are you going to knit with it?